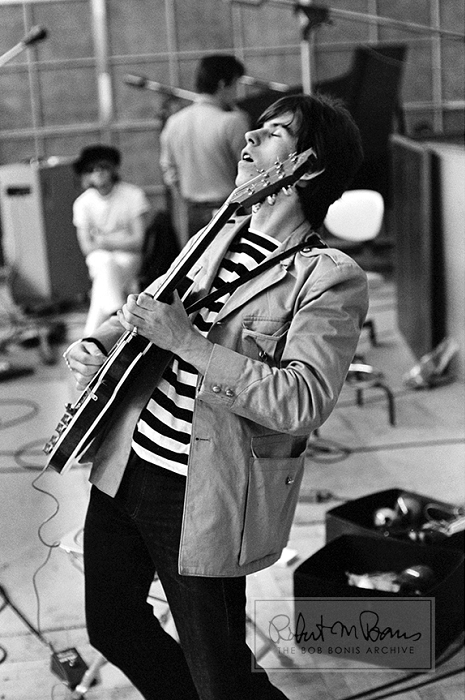 Reaching For The Guitars: Happy Birthday Keith Richards! On December 18, 1943, the rock-n-roll gods willed Keith Richards into existence and guided him along the path that would lead him to The Rolling Stones and to become one of world’s greatest guitarists. Keith, an only child, was born in Kent, England, to Doris and Herbert Richards, a factory worker dad who was injured in World War II during the Normandy Invasion, according to the book Keith Richards: The Biography. Although his father saw little value to music, Keith’s grandfather took an opposite and more playful approach to encouraging the rock-n-roll-tot. Keith’s grandfather, ‘Gus’ Dupree, toured England with a jazz big band, which helped pique Keith’s infatuation with music and the sound of a six string. During an October 25, 2015, BBC Radio program, Keith said his grandfather ‘teased’ him with a guitar he had placed on a shelf out of little Keith’s reach. Then Gus offered him a deal: if Keith could reach the guitar, it was his. And so, with destiny just out of reach, Keith set off on the task of devising a way to reach the guitar. After finding a chair, and the subsequent books and couch cushions needed to reach the prize, Keith reached the peak victorious. But there was a catch: learning the rudiments of Keith’s first tune, ‘Malaguena,’ a classical tune which had become a popular jazz song. After practicing the number “like mad,” Keith’s grandfather let him keep the guitar. Now, with “the prize of the century” in his grasp, Keith practiced at home, becoming familiar with world renowned artists such as Billie Holiday, Louis Armstrong and Duke Ellington. 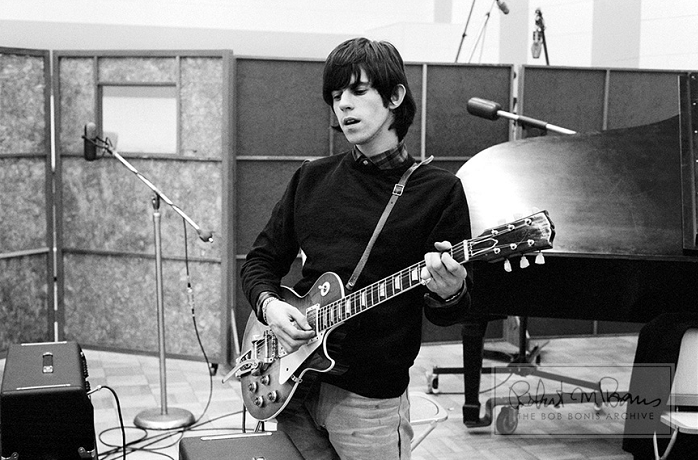 As the years passed and as he grew older, Keef began to focus less on his formal education and more on playing guitar. By the year 1959, he could play most of the solos performed by blues legend Chuck Berry. Not long after, Keith, along with his friends Mick Jagger, Brian Jones, Ian Stewart, and Charlie Watts, began playing together in the group that would soon become The Rolling Stones. In a 1986 Guitar World Magazine article, Stewart said that Keith was without a doubt the band’s leader. Keith’s job was to keep the band working as a finely tuned machine, to which Bill Wyman commented that while most bands follow their drummer, there is “no way of not following” Keith’s lead. From 1964 to 1966, Bob Bonis had the honor of serving as the U.S. Tour Manager for the Rolling Stone’s first five trips across the pond (as well as all three U.S. Beatles tours). Armed with a passion for photography and his Leica M3 camera, Bonis captured the band in their honest, behind the scene moments. These intimate, and often iconic photographs are available now for the first time as strictly limited edition, custom fine art prints from the Bob Bonis Archive. Each photograph is hand numbered, estate embossed, and comes with a Certificate of Authenticity from the GRAMMY Museum® at L.A. LIVE! Keith Richards, we wish you Happy Birthday and a sincere thank you for your years of contribution to the world of music, rock-n-roll, and killer guitar riffs. Here’s to many more! Party on Keef! The Beatles In Film – Behind the Scenes of Help!